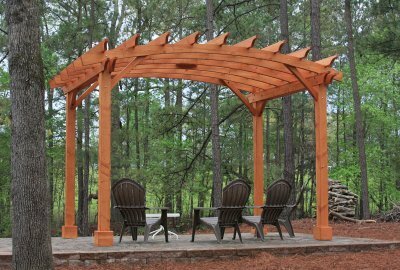 Garden Pergola Kits from Forever Redwood are as versatile as they are beautiful. We make Pergola Kits in a number of styles, with intricately individual designs and spatial flexibility that is second to none. There truly is something for everyone when it comes to our wide selection of Garden Pergola Kits. From Arched Pergolas, Attached Pergola Kits, and Marin Outdoor Kitchen Pergolas, we can offer a diverse range of outdoor kits to meet even the strictest demands. All of our products, including the ones listed here, are made with sustainability in mind. As we deal with lumber as a business, we build all of our products with only restorable forestry wood. This means that not only will you be buying quality, but you will also make a minimum impact on the environment when you shop Redwood Garden Pergola Kits. They are weather resistant, built with strong supports of steel and wood, and can be assembled by hand in little to no time. The Modern Louvered Garden Pergolas was born from the question: "Can I adjust the amount of sunlight I allow in?". Now you can! Our Modern Louvered Garden Pergolas can be small enough to use on your porch or large enough to have as a stand-alone party or chill out space in your backyard. Just ask us how to customize it for you! 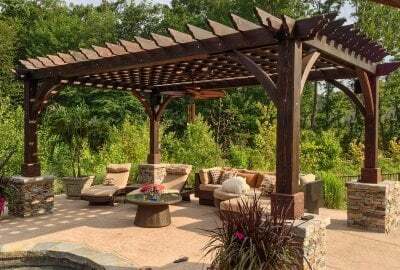 Need a beautiful all natural wood pergola? Want something you don't have to replace for 20 years and that is truly environmentally friendly? Need it your way? Want help with the assembly? From Design to Install made easy. Let us know what you have in mind. We will make sure it is something you can be proud of for years to come. If you’re looking to make an addition to your outdoor space that’s stylish, functional, and durable, then our arched pergola kits are for you. Our high quality redwood arched garden pergolas can transform nearly any space on your property into a beautiful gathering space, fit for many uses year-round. 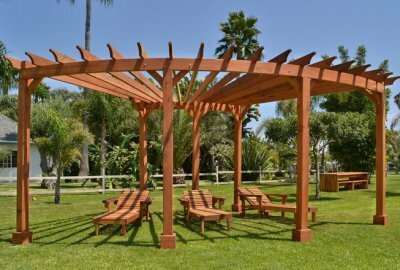 The arched pergola kit is made from 100% forest restoration California Redwood, which means it’s both durable, and environmentally friendly. 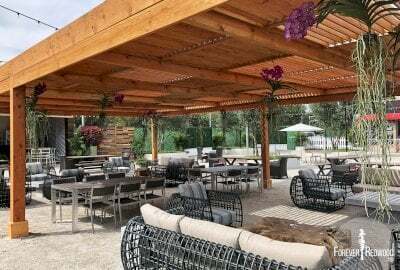 The pergola is hand-crafted and can be used as an outdoor car port, stylish patio covering, small event area, or just a place to unwind in your backyard. 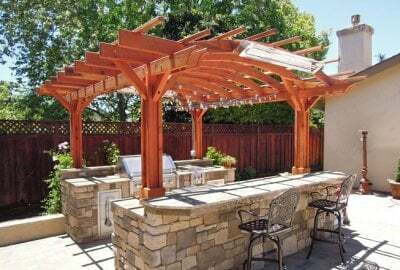 The natural beauty of this stylish massively overbuilt Sebastopol Pergola will shelter your gatherings for years to come. Create a great room, dine outdoors, or just lounge by the pool under one of these handcrafted Pergolas. Walk back in time to when Queen Victoria was sovereign and electricity the wonder of the times. As a respectable member of society, you understood the importance of designing and placing your Victorian Trellis as a focal point of your estate. Of course, you already had a talented carpentry crew to build it how you wanted to sit perfectly within the design of your lovely manicured garden. You say you want a Modern Shade Structure for your place? Check out the Silverado Modern Pergola. Yes, any size. Yes, we can install it for you anywhere in the U.S. 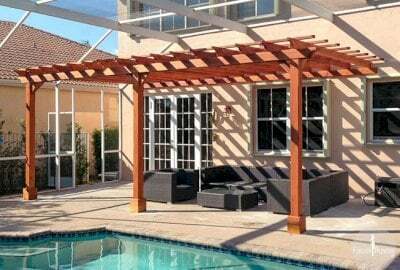 The Montvale Pergolas is one of our most intricate and distinctive shade structure designs. It is built with 8x8 posts and huge roof timbers to add strength to its symmetrical beautiful lines. Yes, it can be built any size you need and if you don't want to put it up - we will do so for you anywhere in the Continental U.S. 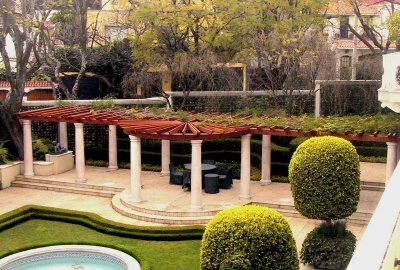 The Forever Redwood Retractable Canopy Pergola is an excellent shade solution. 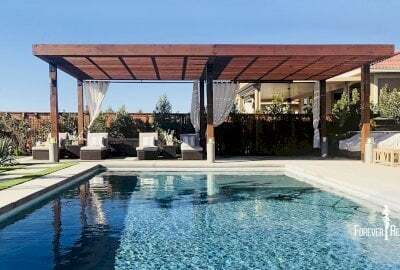 You can build the lovely modern pergola structure any size you need and with our partnership with Infinity Canopy's retractable shade systems you can adjust the amount of shade you need in seconds. 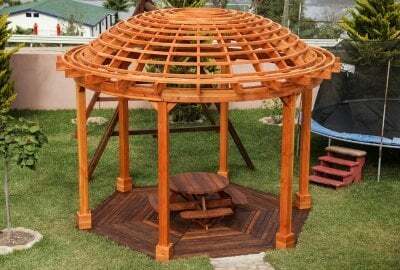 The Round Pergola is a lovely wooden that will adorn your yard for decades. 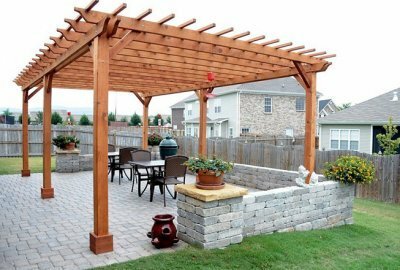 Our Cherry Hill Outdoor Pergola Kit is simple, symmetrical, spacious, and perfect for your back yard, pool, or garden area. These Custom Made Outdoor Pergola Kits can be stand-alone structures or attached to your house. They can be used for shade, an outdoor lounging area, dining area, or even an elegant entrance. Best of all, you can custom design it how you like! 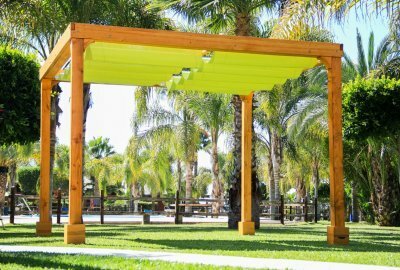 There’s nothing quite like our Custom Wooden Pergola, and we’re not ashamed to say so. They are versatile, elegant, sturdy, and intricately made by hand, which make them truly unique. You can browse our diverse selection and customize each and every one to fit your specific requirements. 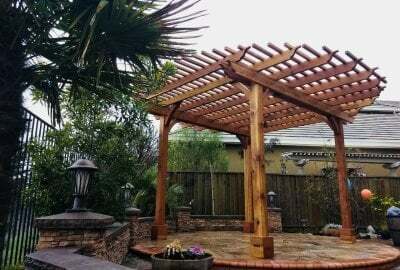 We make Redwood Pergola Kits in all sizes and shapes, with a variety of styles and prices to meet what this diverse market demands. There’s nothing quite like our Custom Wooden Fat Timber Pergola, and we’re not ashamed to say so. We are not going to bore you with a lot of marketing phrases. Just look at the pictures. We hope you agree they are gorgeous, elegant and ridiculously overbuilt by hand with MASSIVE timbers of the highest quality. Best of all, they can be made in any size or shape and we will design with you, then build and install anywhere in the Continental U.S. Yes, one stop shop. 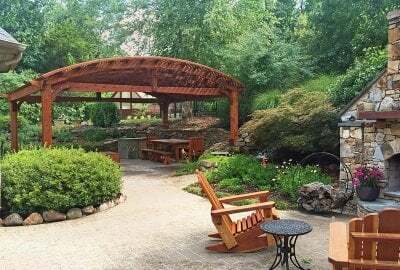 Our Viking Pergola was originally designed as a custom pergola to mimic a Viking Meeting house. The Arched Open Sky Pergola is a popular variation on our best selling Arched Pergola. Its graceful more open roof design can be built in almost any size and configuration imaginable. Attached Garden Pergolas are a great way to add an extension to the outside of your house, without serious renovations or construction crews. 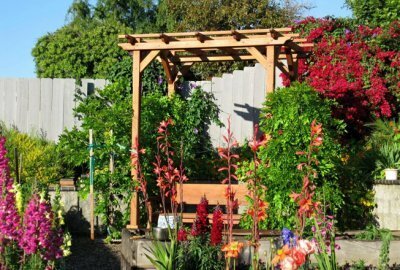 The Pergola Kit attaches to your house with sturdy, stylish redwood beams, that are built to last. 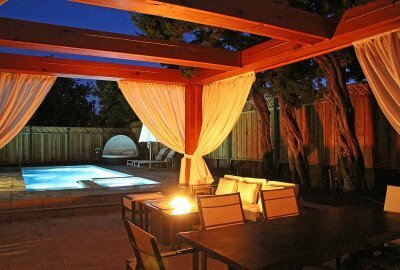 It creates a canopy-like wood covering that lets lots of sun in and improves the aesthetics of your back yard or pool area. 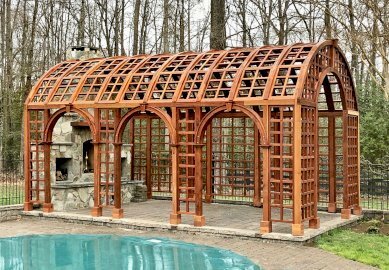 The natural beauty of this stylish arched pergola will shelter your gatherings for years to come. Create a great room, dine outdoors, or just lounge by the pool under one of these handcrafted Pergolas. Sometimes, small spaces call for bold ideas, and our Small Pergola Kits are a great example of how to maximize your limited space. These small-framed kits are perfect for your home garden to hang plants, use to cover an elegant wood bench, and add some style to your front door or patio entryway. 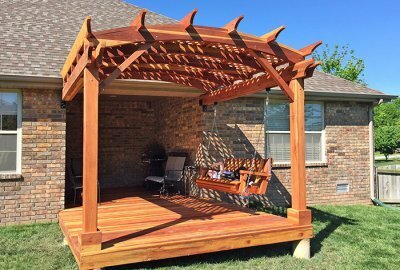 Our Fan Shaped Wood Pergola Kit has everything you need to make a dynamic, functional addition to your home or property. 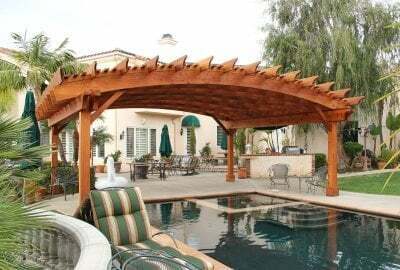 This Corner Pergola fans out to maximize space, and provide a unique Redwood style that’s unmatched. Perfect for entertaining guests, holding an at-home wedding or graduation ceremony, or just kicking back with your family and friends. Much like the Northern California County that shares its name, our Marin Outdoor Pergola kit is truly one of a kind. Made with outdoor cooking in mind this is the perfect way to adorn your BBQ area, pool bar, or even outdoor kitchen. 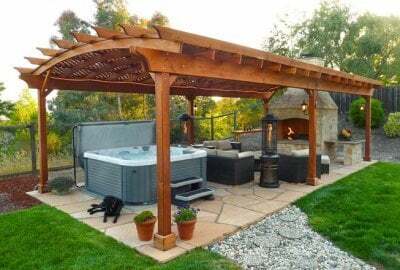 This pergola provides style and functionality and adds a great touch to your backyard or patio. The Dome Pergola takes your breath away. It is the instant centerpiece of any landscape. Its meticulously handcrafted finely finished wood adorns every inch of the structure. Built using extreme resistant California Redwood, it is a wooden temple that will adorn your landscape for decades.